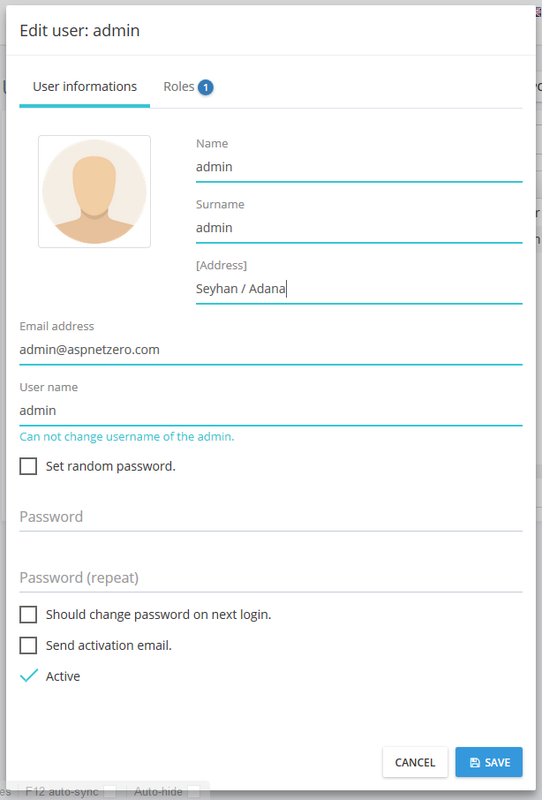 This tutorial is a step by step guide to learn how to add new properties to existing entities, from database layer to UI layer. In ASP.NET Zero, Tenant, User and Role entities are abstract in the framework, others are not. There are some differences between them. So, we separated it into two sections. As a sample, we will work on User entity. We want to add an Address property to the User. Here, we hided existing code in the User class to show it simpler. You can add Address property after existing properties. For testing purposes, we can enter some data for existing users by hand. Note: The UI part of this document is written for ASP.NET MVC 5.x version of ASP.NET Zero. Document will be updated for ASP.NET Core soon. This was for SPA (Single Page Application with AngularJS). It's similar for MPA side. Just open .Web\Areas\Mpa\Views\Users\index.js and add Address field to the table as like Surname. We may want to set Address while creating/editing a User. 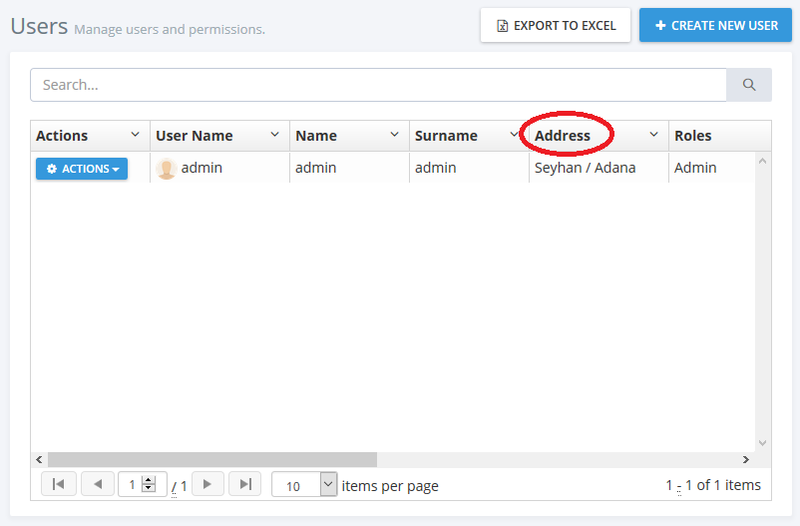 Note: Since we haven't localized "Address" text, it's shown like [Address]. To fix it, you can open localization file under .Core\Localization\ExtendEntitiesDemo and add Address text as like others. You can see this Github commit for all changes applied. As a sample, we will work on Edition entity. Then we add a DbSet property for Edition entity to DbContext class defined in .EntityFrameworkCore project. Price: The Price field we added to the MyEdition. Discriminator: Entity Framework's own field to distinguish Edition and MyEdition entities (automatically created for inheritance). As you see, existing 'Standard Edition' entry changed to MyEdition with Price = 0. Thus, it creates MyEdition entity when we create database from scratch. This was for SPA (Single Page Application with AngularJS). It's similar for MPA side. Just open .Web\Areas\Mpa\Views\Editions\index.js and add Price field to the table. We also added auto mapping for MyEdition entity. We could directly replace Edition by MyEdition if we will never use the Edition class. We left it like that to show different usages. await CurrentUnitOfWork.SaveChangesAsync(); //It's done to get Id of the edition. Notice the highlighted areas. 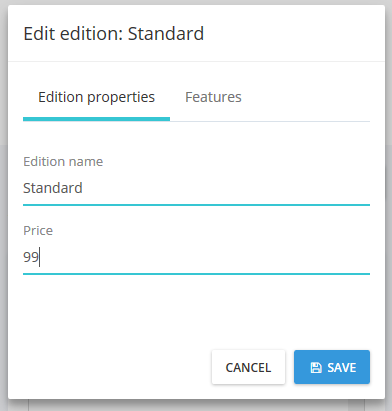 First, we should create MyEdition, instead of Edition and set also Price property. In the update part, we used edition manager to get the edition. Edition manager normally works for the Edition entity. So, we should cast it to MyEdition in order to reach to the Price property.